Petrol Prices are up again by Rs 3.14. After guarding the price line for two-and-a-half months to allow the monsoon session of Parliament to get over, state-run oil marketing companies (OMCs) today announced a hefty increase in petrol prices. Market leader Indian Oil Corporation (IOC) said that it was “constrained” to raise the per litre price of petrol by Rs 3.14 or more due to a “combination of unprecedented factors”. IOC said the increase in free on board (FOB) price of crude and the devaluation of the rupee were the factors for revising the retail consumer price. “The impact due to exchange rate is Re 0.48 and due to increase in international prices is Rs 1.72 per litre. The balance impact of Rs 0.53 is due to value added tax,” the company said. “The FOB was $119.41 per barrel in the last fortnight, which has gone up to $125.18, an increase of 4.8 percent. Similarly, the exchange rate has gone up from Rs 45.67 per dollar to Rs 46.29 per dollar,” the company reasoned. While there will be/could be debate about the need to do it, the timing is brilliant. It has been done at a time when opposition can do nothing about it in the monsoon session! Even the coalition partners did not know about this happening. Also matches Sonia's return to her palace - brilliant gift from congis to their master. Oh, I thought it was the Communal Violence Bill ..
Ek kaam kar... Khana peena bhi band kar de, then you will have no impact. r u asking him to go ahead and support Modi' fast? BTW, the UPA govt is doing well enough to dig its own grave if it continues like this.. but.. but..these will stop when elections r round the corner . Last edited by PeaceSeeker; September 17th, 2011 at 05:19 AM. Last edited by marvelous; September 17th, 2011 at 08:39 AM. btw what you write proves that all countries have their own pricing of petrol, it is not necessaory that prices in India have to be in line with the rest of the world - specifically when the government is failing on all fronts! So now what will happen if India sells petrol at the same price it buys it at ? For all those already reeling under a series of hikes in petrol prices on the back of zooming inflation, here is some news that will enrage you further. Data of retail prices in countries across the world shows that Indian prices are amongst the highest in the world at current exchange rates. And, if you even out the differences in purchasing power of different currencies then Indian petrol and diesel prices become the highest barring some tiny, remote countries. Even a simple comparison of retail prices in different countries by converting them to Indian rupee reveals that petrol in India is more expensive than 98 other countries. Among 157 countries for which data is available, those belonging to the Organization of Petroleum Exporting Countries have the lowest price. The Organisation of Petroleum Exporting Countries (OPEC) are the ones that have huge oil reserves and are its main producers. So, petrol is cheapest in Venezuela at just Rs 1.14 per litre. In Iran it sells for Rs 4.8 per litre. The second group comprises of countries like the US, Iraq, Indonesia, etc, where minimal tax is levied on petroleum products. They also have lower prices than India. A litre of petrol costs Rs 42.82 in the US. India tops the group of countries which have moderate to high tax regimes. Others in the group are the EU countries and others like Singapore, New Zealand, Thailand and Brazil. At Rs 69.90 -the average price of petrol in 24 Indian cities -Indian prices are now comparable to price of petrol in EU. Romania has EU's cheapest petrol at Rs 72.33 per litre. But Diesel, LPG and Kerosene prices are still subsidized. In UK, the diesel costs more than petrol. In US, diesel costs more than lower grade petrol but lesser than higher grade. The costs in US vary a lot between the states. New Delhi, Nov 3 (IANS) Oil marketing companies Thursday raised petrol prices by Rs.1.80 per litre from midnight, just over one and a half months since the last hike. The hike was to fight depreciation of the rupee and high global crude prices, they said. 'The prices would be hiked from Friday. All three companies have decided to hike prices by Rs.1.80 per litre,' an Indian Oil Corporation (IOC) official told IANS. Old picture when the petrol prices were below Rs.50. 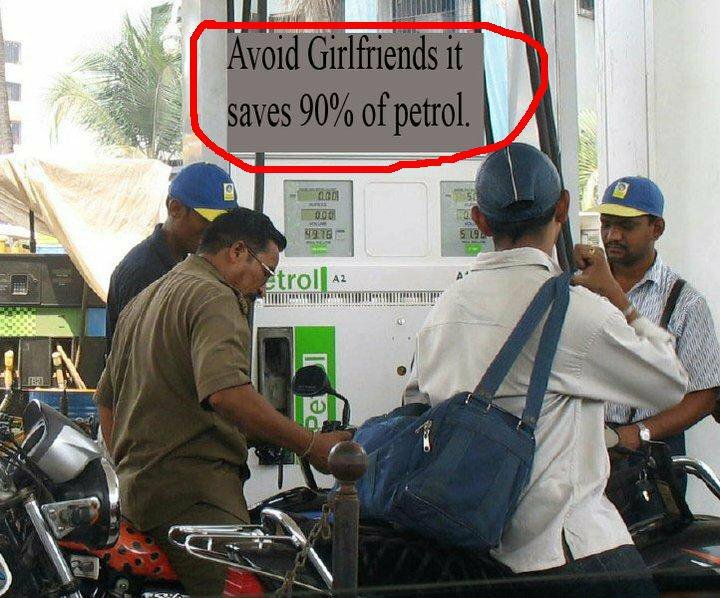 SoniaMaata should ensure that every petrolpump in India has this board.